we will be breeding litters later in the year. if you would like to contact us with an expression of interest in these litters we would be happy to chat with you. our puppies are bred from strong working lines, have excellent hip and elbow scores and have been genetically tested for hereditary diseases. 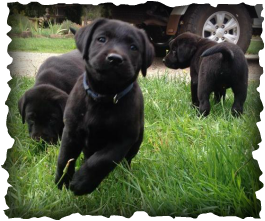 Puppies from Reveirter Kennels are used extensively for retrieving and field work, service and therapy dogs and have strong prey and game drive.